Briarwood Parke… countryside Foley, AL… One of the friendliest, most attractive places to call home in Baldwin County. A well-kept neighborhood that retains that wonderful rural feel, Briarwood Parke is still conveniently located among numerous town-life amenities. US Hwy 98 sits less than one minute from your front door, giving you quick and easy access to all that Baldwin County has to offer! Within 15 minutes you can reach Foley Beach Express or highly sought-after Tanger Outlets, and Walmart is a mere 10 minutes away! With schools close by, as well as fast food and fine dining destinations all throughout the area, your location offers major advantages! Enjoy the serene environment from your covered front porch, which is truly welcoming with tile flooring and a decorative hardwood front door. From the moment you walk in, the home feels fresh and bright with sparkling laminate hardwood floors and great recessed lighting throughout. In the living room you’ll find a large, cozy fireplace with custom hardwood hearth, gorgeous hardwood built-in shelving, and a nicely accented trey ceiling. French doors lead into your cheerful sunroom, which provides beautiful views of your expansive grassy backyard and sparkling blue pool. You will love your sunlit formal dining room, which creates the ideal mealtime atmosphere with a custom trey ceiling, custom chair-rail and crown molding, and a really regal chandelier! Your perfect-sized kitchen features: electric range, tons of cabinet space, great tile floors, and breakfast bar overlooking quaint breakfast area. With crown molding and ceiling fans in every bedroom, your extra-spacious bedrooms are sure to please! You will feel right at home in your spacious Master Suite, complete with laminate hardwood floors, custom trey ceiling, double windows, and in the master bath: his-and-her vanity sinks, garden tub with large block-glass window, and separate shower. Welcome to comfort! With beautiful landscaping and a well-manicured front yard, the property has fabulous curb appeal. And the charming white picket fence surrounding the entire back yard and pool area adds further allure. Without a doubt, the sparkling blue pool and sunny back patio will become one of your most preferred places to be. Perfect for either relaxing with your favorite novel, or for exercising at home, your pool is in great condition with a new pool pump. Don’t forget about your double garage with bonus golf cart door! Between the garage and floored attic, tons of storage is available! This home is just waiting for you! 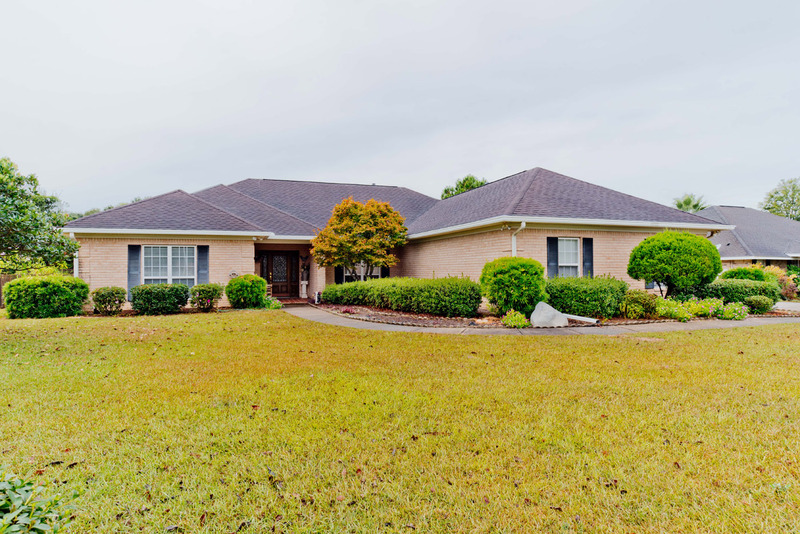 Tour this amazing Briarwood Parke Foley AL Pool Home for sale with the Jason Will Real Estate Team by calling our sales office at 251-866-6464.